There are times when re acquainting yourself with a beer is like meeting an old friend. The nature of bottled beers (and one of its most interesting aspects) is that ranges are ever changing. This brings in new brewers and brands which keep the subject fresh, innovative and diverse. This said it is always good to see a beer that once brought you pleasure in a qualitative sense make a re appearance. You can, as they say, never have to much of a good thing...or so you hope. 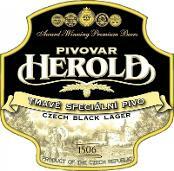 I recently re acquainted myself with such a beer, Pivovar Herold Black Lager from Breznice in Bohemia. This beer has developed quite a reputation over the years (I first came across it some 15 years ago) as unlike many of the Tmave (Dark) lagers brewed by Czech breweries which maintain a rather balanced but neutral palate, with the dark malt emphasis toned down for more general appeal, Herold Black had a defined house style and character with a depth of flavour which made it stand out from the crowd. The strength at 5.2%Alc/vol. remains the same but the definition of flavour had given way to a looser knit style. The once dark roasted rounded characterful top note had gone with a metallic aroma replacing the once inviting floral hop character. It is still pleasantly drinkable, but not what it was... So what has caused the change? The label still refers to the impressive 70 day lagering period, and this may indeed apply to some lagers stored at Breznice...but it does not necessarily refer to the product in the bottle. 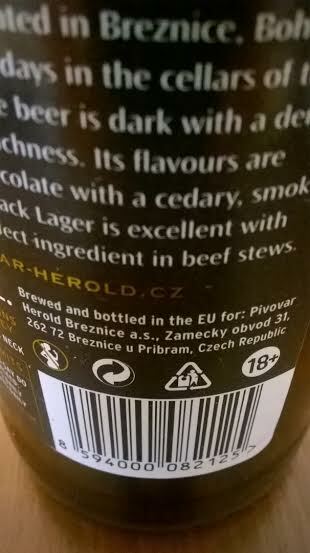 More evidence of change also lay in the wording above the brewery address 'Brewed and bottled in the EU for' suggests the brewing is being out sourced and may not be made at Breznice at all. It is an established wisdom within the brewing industry that producing a product other than at its place of origin rarely if ever produces the same product - despite claims in marketing circles to the contrary. There may be a two tier situation going on here, increasing production brings with it new challenges, but out sourcing is the less desirable option. If this is the case with Pivovar Herold Black it would indeed be nice to see a return to the old order...and not compromise on quality.